Here, our vision of excellence is taking shape to integrate health care, research, and teaching on a whole new level. With custom-built facilities, state-of-the-art equipment, and nurturing healing environments, we are pushing the boundaries of innovation for our current generation and those to come. In addition, the McGill Academic Eye Centre resides at the Glen-adjacent building on 5252 de Maisonneuve Blvd. W., and offers all adult ophthalmological care for the MUHC. Access by car: Enter on Decarie Blvd. 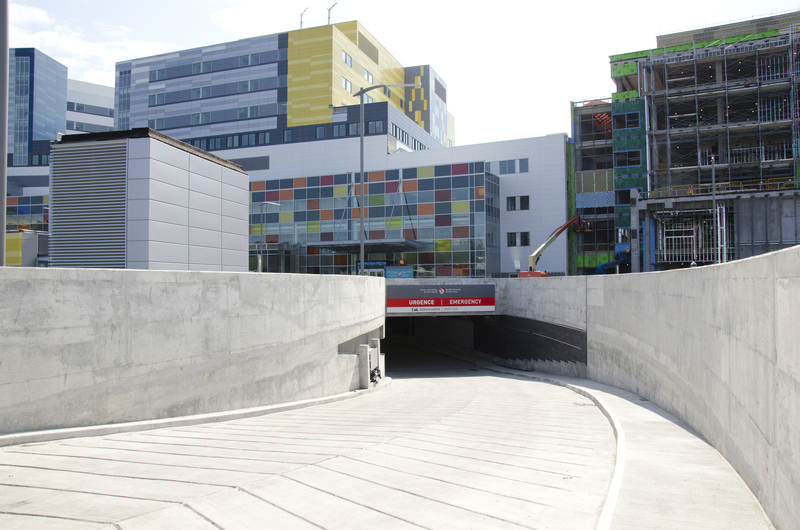 Take the designated ramp to underground parking level S1 (the temporary emergency parking available across from the Emergency Department main entrance). Access by Metro: Take the underground tunnel from Vendome Metro station to the hospital main plaza. Take first set of elevators to S1 level. Walk towards the underground parking. The entrance is accessible from the underground parking. In most cases, you’ll need a referral from a general practitioner in order to get an appointment with a specialist at the MUHC. To make an appointment for an adult patient, please call the MUHC Appointment and Referral Centre at 514 934-8488 Monday to Friday from 8 a.m. to 5 p.m. For a first time appointment in a service, you will be told how to send your consultation request and what information to include. Please note that you can ask for a follow-up appointment at the clinic reception, following your visit. If you are visiting the Glen site for the first time, you must go to the Admitting Office at C RC.0046 in the Promenade Larry and Cookie Rossy to obtain a new MUHC hospital card prior to your first appointment. The Admitting Office will try to let you know in advance of the day and time you will be admitted. In some cases, your admission date could be delayed on short notice. Upon arrival, you should have a hospital card made (if you don’t already have one). You should also bring your Medicare card. If you do not have a valid Medicare card, pre-arranged payment must be made with the Finance Department (local 48048). Although the hospital makes every effort to avoid such situations, you might arrive to be told that you cannot be admitted. In such cases you will be asked to return home or to make arrangements for accommodation in Montreal until a bed is available. Information regarding reasonably priced accommodations is available from the Social Service Department (local 31569). Although the MUHC provides hospital gowns, you may feel more comfortable in your personal effects. You can bring your own pyjamas/clothing, housecoat, and slippers/ shoes. You should bring a toothbrush, toothpaste, tissues, shaving items, soap, body lotion, sanitary supplies and other personal care articles. Since storage is limited, you are asked to bring only a small suitcase. You should also bring your valid Medicare card and MUHC card. If you do not have an MUHC hospital card, the Admitting Office staff will make one for you. If you do not have a valid Medicare card, pre-arranged payment must be made with the Finance Department (local 48048). Please do not bring any items of value. If you do, you will be asked to turn them over for safekeeping or to sign a form that releases the hospital of any responsibility. If a theft or a loss occurs, you should immediately make a report to your nurse. When not in use, dentures, eyeglasses and hearing aids should be placed inside your bedside table in containers provided by the hospital. The MUHC is not responsible for patients’ property or for valuables and cash not left in safekeeping. If you wish to temporarily leave your room, please inform your nurse or somebody at the care station. It is important for the nursing staff to know where you are at all times. At the time of your admission, you will be asked to sign a general consent form for treatment and tests. For patients under the age of 14 years, the person with parental authority will be asked to sign on the patient’s behalf. For adult patients who have been deemed incapable by a physician, substituted consent may be acquired from the patient’s legal representative. For further information, you may contact the Ombudsman/Complaints Commissioner (local 35655) or ask to speak with a Social Worker from the Social Service Department (local 31569). You may also attempt to seek advice from the Office of the Public Curator (514 873-4074). At the same time, you will be asked whether or not you agree to release personal and confidential medical information to your insurance company (if any) and/or to referring doctors, hospitals or clinics. The Glen site has single-patient rooms with a private ensuite shower and toilet. Single rooms allow you to talk to your doctor and nurses in private and they also help to minimize the risk of hospital-acquired infections. 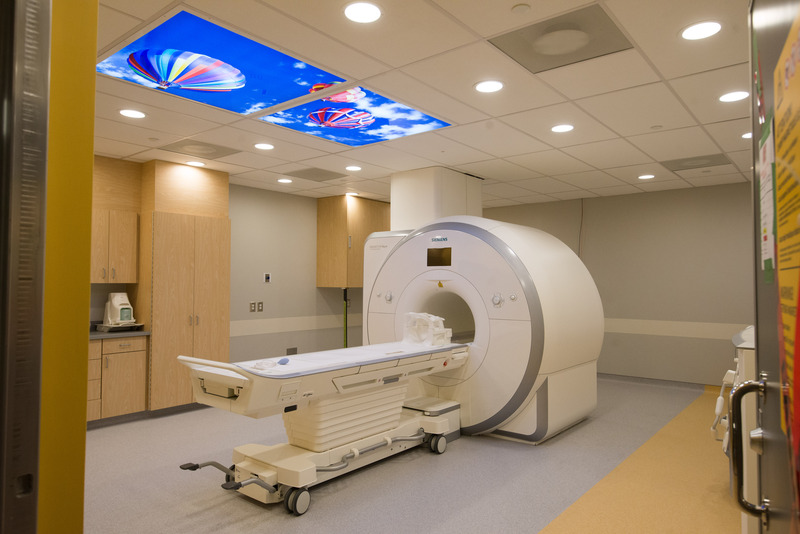 Each room comes with a built-in closet, with lock, to store personal belongings, and a large television screen, which will be used for entertainment as well as by healthcare workers to share test results, x-ray images, and additional information. Your room also has a couch, which a family member can use to spend the night. Finally, each room has a large window with plenty of natural light. A family member can stay overnight and sleep on the couch in your room. If needed, the Social Service Department (local 31569) can provide you with information regarding reasonably priced hotels in the area. Hospitalization and outpatient services charges: for who? For Quebec residents with a valid Medicare card from the Régie de l’assurance maladie du Québec, most hospitalization charges and outpatient services are fully covered. If you are a patient from any other country, or a Canadian resident without a valid Medicare card, you are responsible for all hospitalization expenses and professional fees for services received at the hospital. You must make an advance deposit equal to seven days payment upon admission to cover the hospitalization charges. You will also receive a bill for professional services. To make your advance deposit, please contact a finance representative at the Patients’ Cashier’s Office (room B S1.3885.1, local 34627). A deposit may be made by certified cheque, credit card or debit card. If you pay by credit card you can also do so by telephone (local 34627). It is sometimes possible to obtain a temporary Medicare card if one has been lost or is expired for less than six months. In accordance with an agreement between all Canadian provinces, patients from other provinces with a valid Medicare card from their home province are also fully covered for most services. The completion of forms for insurance and other purposes is not covered by Medicare and doctors may charge a fee for this service. Certain medical treatments and services are not covered by Medicare. In these cases you will be informed. It is up to you to contact your insurance company regarding possible reimbursement of associated costs. The hospital is not responsible for decisions made by insurance companies about reimbursement of services not covered by Medicare. There is a daily hospitalization charge for patients who no longer require active medical treatment and who are awaiting transfer to a long-term-care facility. These charges have been determined by the Quebec Ministry of Health and Social Services. Your doctor will advise you of this change of status and the Social Service Department (local 31569) and the Accounting Office (local 42732) can provide more details. Ambulance charges are your responsibility unless you meet certain criteria for free ambulance transportation. Such criteria include transportation to a hospital following a traffic accident, or when a doctor has signed a form attesting to the medical need for transport for a person over age 65, or for certain people receiving Income Security benefits. Of note, private insurance will sometimes reimburse ambulance fees. Your team consists of a variety of healthcare professionals and staff who work together, in collaboration with you, to care for you and your family. Among the professionals are nurses, nursing assistants, patient attendants (orderlies), doctors, physiotherapists, occupational therapists, dieticians, pharmacists, social workers, blood technicians, ECG technicians, as well as respiratory therapists. Some of the support staff you may encounter include unit coordinators (the clerk at the front desk of the unit), housekeepers and transport attendants. The MUHC takes pride in its dynamic nursing staff who are at the centre of the care team. Nurses are the ones you will have the most contact with you during your hospital stay. They play an important role in providing care, as well as supporting and educating patients and their families. They do this in many ways, including through communicating important information and actively listening to your concerns so that the team can understand how to best care for you and your family. You will have a nurse assigned to you at all times—the nurses on your care unit may work in 8- or 12-hour shifts. Your nurse should be your first contact if you have questions about the care you receive. A physician (doctor) is in charge of your treatment plan and supervises the medical team: medical fellows, residents and students. Depending on our unique needs, your doctor may consult with other specialists and consultants. When a doctor transfers your care to another doctor, they communicate detailed information about you before this change. There is always a member of the medical team available to answer your questions. The MUHC is a teaching hospital. Students from a variety of healthcare professions may be involved in your care. Should you have a concern about their services or the services provided by any other healthcare professional or staff member of the hospital, please talk to the Nurse Manager or the Assistant Nurse Manager on your care unit. Care stations are centrally located and there are decentralized stations near each room, so clinical staff are never far from their patients’ sides. and between 9 a.m. to 2 p.m. and 4:30 p.m. to 7 p.m. Saturdays, Sundays and holidays. Here, you will find a complete selection of various meals and snacks that can be consumed on site or taken to go. Our recipes promoting healthy nutrition habits are at the forefront of our values and our warm and welcoming staff will be there to greet you as best they can. We’ll be waiting for you! The MUHC Catering service offers a variety of tasty quality dishes that are designed to suit the need of any of your events or special occasions. For six or more people, you or a member of your family can take advantage of this service by choosing from a variety of selections including hot and cold breakfasts, cold buffets, sandwich and salad platters, pizzas, desserts and coffee service. We also offer custom order service should you wish to order a special cake or menu not found within our regular selection. For more information, please contact our catering service (local 36232) and we will be pleased to serve you. This free service is offered with limited access and a controlled environment. No streaming videos such as YouTube, Netflix or any other similar activities are permitted. This basic Internet service is offered “as is” without support or help from our clinical staff, who are not trained to respond to technical support questions. Some volunteers might be able to help you establish an Internet connection for your device if you are experiencing any technical difficulties. Interpreters are available if you or your family are unable to speak French or English, or if your understanding of these languages is limited. An interpreter may be requested on the patient’s behalf by healthcare staff. The Larry and Cookie Rossy Promenade runs all along the colour windowed entrance of the Glen site and connects the Royal Victoria Hospital entrance with the Montreal Children’s Hospital entrance. 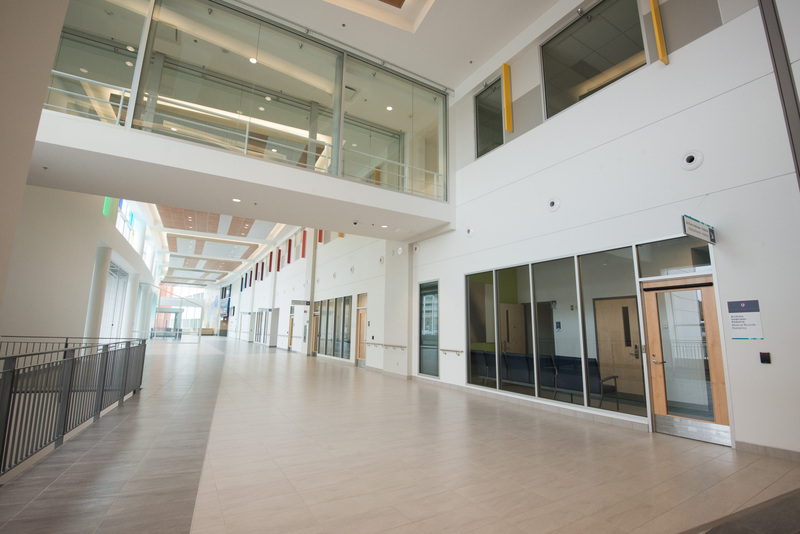 Filled with natural light, this spacious area serves as the location of our adult and pediatric Admitting Office (C RC.0046), the McConnell Resource Centre (B RC.0078), as well as the Information and Parking offices. 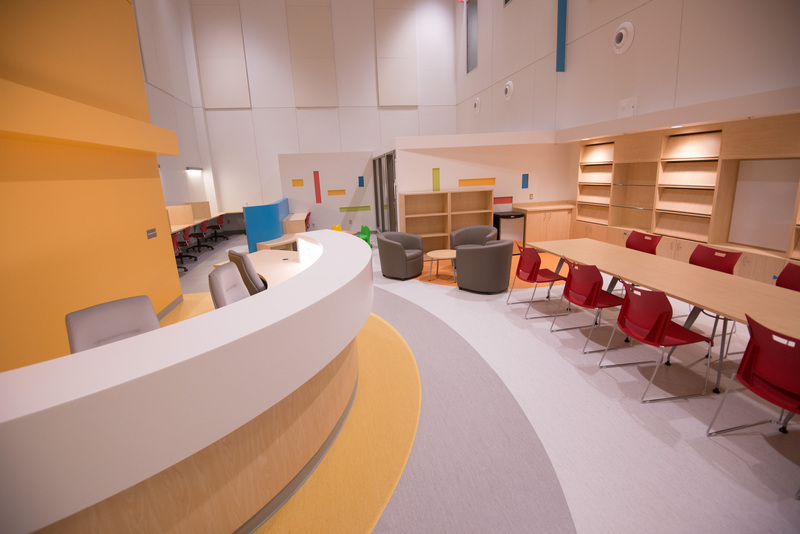 The McConnell Resource Centre, located at the heart of the Larry and Cookie Rossy Promenade on the main floor of the Glen Site, is a shared space with two sections: a Patient Resource Centre and a Medical Library for personnel of the MUHC. The Patient Resource Centre has a growing collection of books and pamphlets for adult patients and their loved ones and offers access to computers, printers, a photocopier, a scanner, a fax and WiFi. To help ease the anxiety and uncertainty many new cancer patients and their loved ones experience, the Cedars Cancer Centre features a resource centre (D RC.1329) offering a wide selection of education materials, such as pamphlets, books, DVDs and access to the Internet. Full-time staff is on hand to help patients and their families find the information they need, including details about support groups, information sessions, as well as referrals for wigs, prosthetics and other necessary items. The Glen site is entirely landscaped, with green space making up one third of the 43-acre site. On the North side, you will encounter a large plaza adorned with art installations, walking paths, gardens, and seating areas. The Cedars Cancer Centre has its own healing garden on the East side and The Montreal Children’s Hospital comes with a playground on the South side. The Glen site gardens help create a healing environment. They act as an oasis for patients, families, personnel and members of the community to enjoy fresh air and find tranquility. The Glen site is home to a prestigious collection of public art intended to comfort, encourage and inspire you, your family, and our healthcare professionals, as well as showcase the outstanding talents of Quebec artists. Eleven large-scale works made by renowned local artists are on display throughout the hospital, as well as our 1,600 item collection being relocated from MUHC legacy hospitals. The Prayer and Meditation Room, for people of all faiths, is located at C 02.1178 and is open 24 hours per day. The MUHC has four Ombudsmen/Complaints Commissioners to assist patients, their families and legal representatives in helping them to resolve complaints. The Ombudsmen/Complaints Commissioners are available to help you if you have questions about your rights as an MUHC user or if you need advice to help resolve any perceived conflicts. The Ombudsman/Complaints Commissioners can be reached by telephone (local 35655 or 48306). The patient complaint system is governed by Quebec legislation, and is outlined in a brochure available on all sites of the MUHC. All patients of the MUHC have specific rights, within the limits of Quebec legislation, concerning their expectations to quality of care and treatment. Your rights and corresponding responsibilities are more fully explained in the MUHC Code of Ethics. please advise, or have your legal representative advise, any professional member of your MUHC treating team as soon as possible. At the time that you write a mandate, advance directive or living will, it is a good idea to tell your designated legal representative, a member of your family or a close friend of your desired intentions and to provide this person with a copy of the necessary documents. The Patients’ Committee has a legal mandate to monitor the quality of life for the users of the hospital, to assess their level of satisfaction, and to assist and accompany them as necessary in the defense of their rights. Members of the Patients’ Committee actively participate in the MUHC community by serving on key hospital committees and in advising hospital staff and administrators of the patient’s perspective, thereby ensuring that patients’ concerns are heard and their interests are preserved. The Committee supports and promotes patient partnership initiatives in its belief that patients have the right to be involved in making decisions at every level of their care. The Committee also provides patients with information relating to their rights and responsibilities and, as needed, will assist patients in filing a complaint. The Patients’ Committee is represented on the MUHC Board of Directors. To reach a member of the Patients’ Committee, call local 31968 and leave a message. A member of the committee will respond to your call. Volunteers work mostly at the patient’s side in specialized programs. Some of these programs include CanSupport, cuddles, dialysis/transplant, friendly visits, humour, information, music and food/sundries carts. Patients, their families and friends can expect a visit from well-trained and supervised volunteers from all walks of life and all age groups. If you are interested in volunteering, call local 34300. It is important for the healthcare staff to be able to provide care while maintaining a supportive and comfortable environment for patient and family. The number of family members and visitors in the room is dependent upon the patient’s condition. Guidelines for the presence of family and visitors will be flexible and will respond to the preferences and changing needs of the patient. At the Glen site, families can stay overnight in the single patient rooms on sofas. If doing so, please speak with the patient’s nurse. In areas without these in-room facilities (in critical care units), speak to the patient’s nurse about how you stay overnight. Respect restricted visiting rights. This normally occurs during an outbreak of a contagious illness. If you discover a fire/smoke or a burning smell, immediately report it to your nurse or someone at the care station. If you hear the fire bells ringing, follow the instructions of the hospital staff. For the safety of patients and staff, fire drills are held regularly. If a fire drill occurs during your stay, please follow the instructions given by your nurse. The MUHC strongly supports the Anti-Tobacco Act. You must report all accidents or falls to a staff member. For security reasons, all MUHC personnel must wear his/her MUHC ID card at all times. ID cards allow for patients, parents, visitors and suppliers to identify MUHC staff. Your doctor will inform you when he or she believes that you no longer need to stay in the hospital for active treatment. Your doctor will also let you know the approximate day of your discharge or of your transfer to another institution. On the day of your discharge, you will be asked to check out of your room by 11 a.m. If you are unable to leave the hospital by this time, you can wait in the patients’ sitting room located on your floor. If there are outstanding charges, you should pay them before you leave at the Patients’ Cashier’s Office, room B S1.3885.1. You may pay by debit or credit card, in person or by telephone if you pay with a credit card (local 34627). If you feel you’ll require support and care after you go home, please speak to your doctor, nurse or social worker, as they can help you make the necessary outpatient arrangements. Please be sure to take all your possessions when you leave. If your nurse has placed your valuables in the Patients’ Cashier’s Office, you should claim them before leaving (room B S1.3885.1). Your doctor may request that you return to a clinic for a follow-up appointment. Before you leave the hospital make sure you have all the necessary information about where to go for this appointment or who to contact in order to make the appointment. Curious to learn more about the Glen site? The Glen site, located at 1001 Blvd. Décarie, will welcome its first adult patients on April 26 2015 and first pediatric patients on May 24 2015. Coloured windows lining the front facade of the Glen mark the main entrance to both the adult and pediatric hospitals. The Larry and Cookie Rossy Promenade runs all along the coloured-windowed entrance to the Glen site and connects the Royal Victoria Hospital entrance with the Montreal Children's Hospital entrance. Filled with natural light, this spacious area also serves as the location of our adult and pediatric admitting offices. The main entrance to the Royal Victoria Hospital is found on the north side of the Glen coloured windows. It connects to the Montreal Children's Hospital entrance via the Promenade. The main entrance to the Montreal Children's Hospital is found on the south side of the Glen coloured windows. It connects to the Royal Victoria Hospital entrance via the Promenade. The Montreal Children's Hospital at the Glen site is also situated adjacent to the Shiners Hospital for Children, which is expected to finish construction in Fall 2015. The Montreal Children's Hospital Atrium is a three-story open area that brings natural light into the children's hospital. 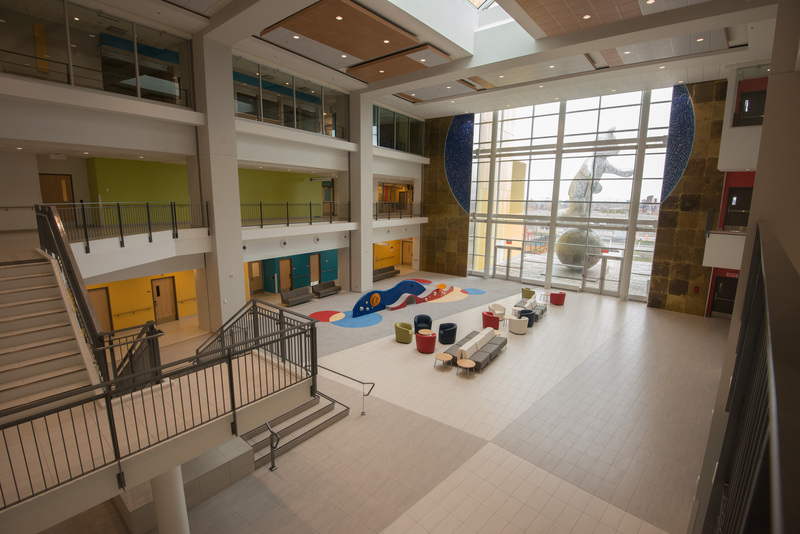 Complete with an indoor play area, the atrium serves as a communal space - one that is watched over by our giant teddy bear sculpture made by local artist Michel Sauliner. Located just outside of the atrium is also an outdoor playground for patients and their families to enjoy. The Montreal Children's Hospital has its own Family Resource Centre, located on the main floor in Block A. Designed to act as a family-friendly zone, this centre is a hub of information for patients and their families to enjoy. 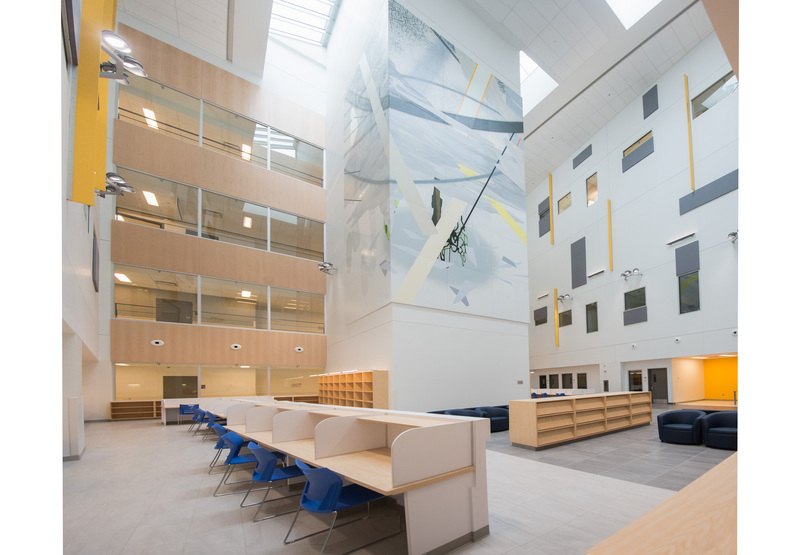 The Adult Resource Centre, located at the centre of the Glen site, is an open space for patients, visitors and MUHC personnel to use at their leisure. Equipped with computers and the latest medical information, not to mention an in-house librarian, this central information hub also houses one of our impressive art pieces - a 54 canvas painting called Prisme by Jean-Sébastien Denis. 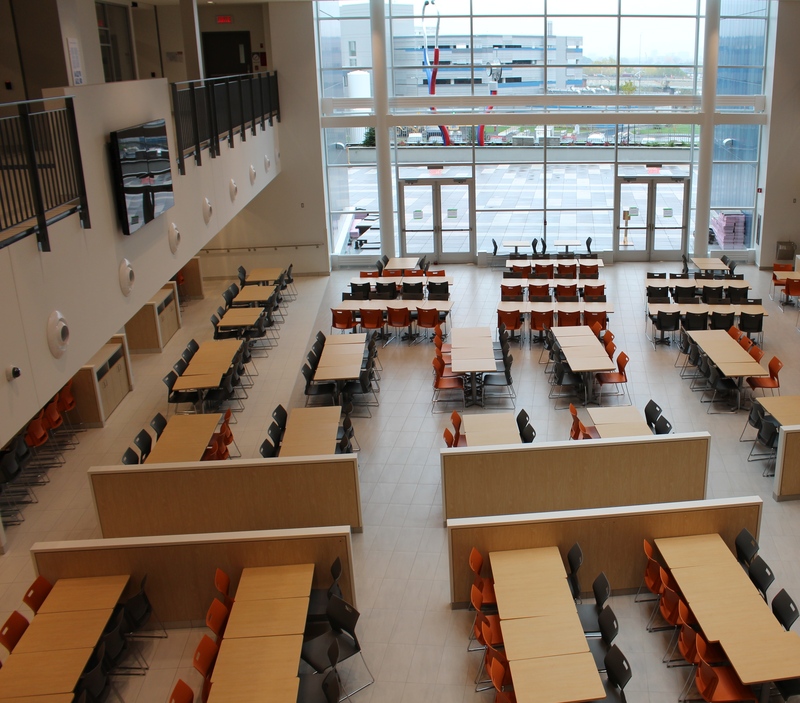 The cafeteria at the Glen site comes complete with an outdoor terrace, for indoor and outdoor seating. It will open from 7:00-19:00 Monday to Friday. On weekends or statutory holidays, it will be opened from 9:00-14:00 and 16:00-19:00. 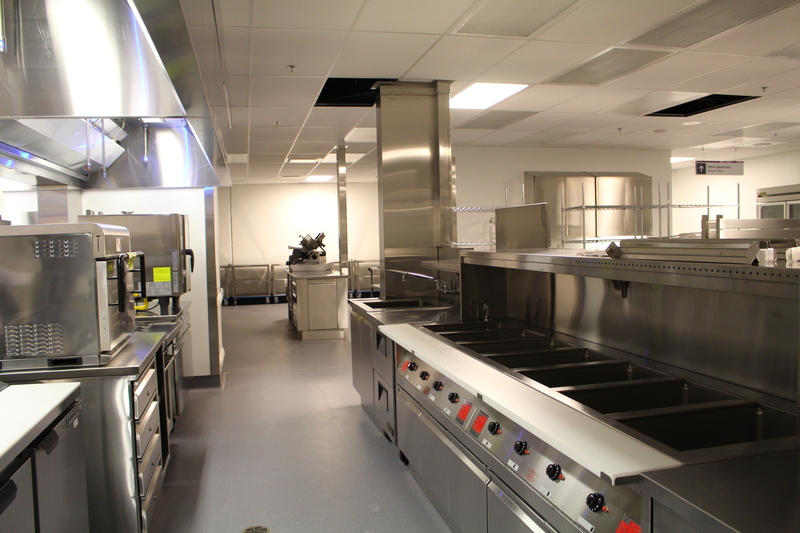 The Glen kitchens are expected to prepare approximately 1 108 000 meals at the MUHC Glen site in 2015. Both our adult and pediatric emergency departments (ED) have two dedicated entrances, one for the public in the front and one for ambulances in the back, both of which are covered by sheltered bays. The public ED entrance has dedicated short-term parking for visitors to quickly access the admitting desk. Made up of 100% single patient rooms, the ED has 2 triage rooms, 8 fast-track exam rooms, 4 resuscitation rooms, 33 stretcher rooms (including 4 isolation rooms) and 6 exam rooms. The new adult Emergency Department (ED) is designed in a linear style that encircles a central staff working core, meaning that it can expand and contract as volumes require. This allows for more efficient staffing since the ED can adjust incrementally, better visibility of patients and other staff, better traffic flow to separate patients, staff, and hospital visitors who will each have their own designated hallways. Each of our 20 state-of-the-art operating rooms comes with Telehealth technology and cutting-edge equipment, not to mention are all also equipped for minimally invasive surgeries. Each of our 500 patient rooms are private, where natural light, spectacular city views, wifi access, air conditioning, a flat-screen television, and an en-suite bathroom will help to create a positive healing environment. A typical ensuite bathroom found in each of our 500 single-patient rooms. Large reclining couches found in each room allow family members to rest comfortably during overnight stays. Each in-patient floor has a family room for visitors of patients to use at their leisure. They come equipped with a kitchenette and lounge chairs. Inpatient floors are divided into three pods of 12 rooms, with one dedicated central caregiver station per pod. Nursing stations are centrally located near each room, so medical staff are never far from their patient’s sides. Cedars Cancer Centre is the new home for all centralized oncology care offered by the MUHC. It has a dedicated drop-off zone and entrance for the convenience of our patients. The Cedars Cancer centre will treat approximately 700 patients per day. Spread out over three floors, the Cedars Cancer Centre includes a chemotherapy treatment unit, a dedicated pharmacy, a palliative day centre, and radio-oncology clinic. The first of its generation to be installed in Canada in June 2014, this automated radiosurgery system is revolutionizing how physicians treat tumors, cancerous or not, throughout the body. Contrary to regular machines, which are static, the Cyberknife moves around patients. its articulated arm administers a pre-calculated dose of radiation with very high precision. The machine can also access hard-to-reach areas and has little effect on nearby healthy organs and cells. In total, more than $255 M have been invested in the latest technology at the Glen site to provide the most advanced treatments tailored to patients' individual needs. 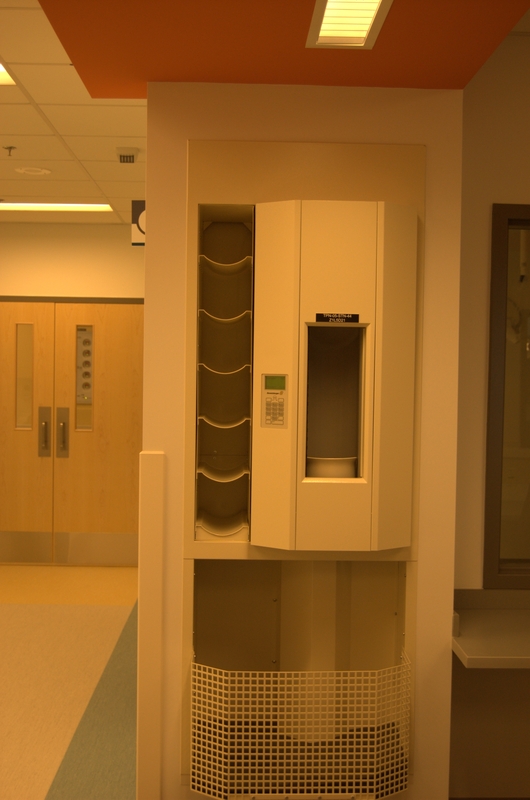 Hidden behind the walls of the Glen, the pneumatic tubes carry samples, medication, and emergency medical supplies to different sites around the hospital. A capsule (roughly the size of a 2L plastic bottle) can travel 20 feet per second, or 20 km/h. We estimate these tubes making over 5,000 transactions per day! These pneumatic tubes capsules are tracked using an RFID system so they cannot get lost. They can also be automatically returned to their sending statuions after delivery. At the Glen site, we have combined Womens Health with Neonatal Health, creating one single floor where activities are fluid between departments. The Birthing and Postpartum units, Gynecological ORs, and Neonatal and Pediatric Intensive Care Units are all located on the 6th floor with easy connections between each unit. 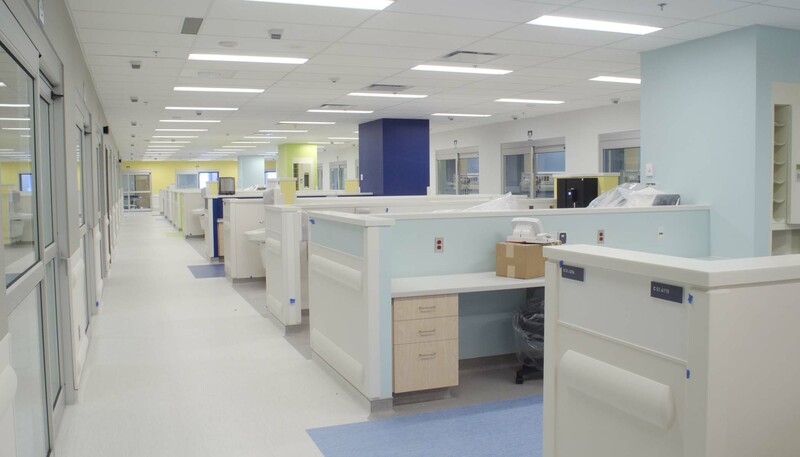 Our Pediatric Intensive Care Unit (PICU) is located on the 6th floor of the Montreal Children's Hospital. Finding your way around the Glen is made simpler by colour-coding our different services: for example, adult care is dark blue, while pediatric care is turquoise. 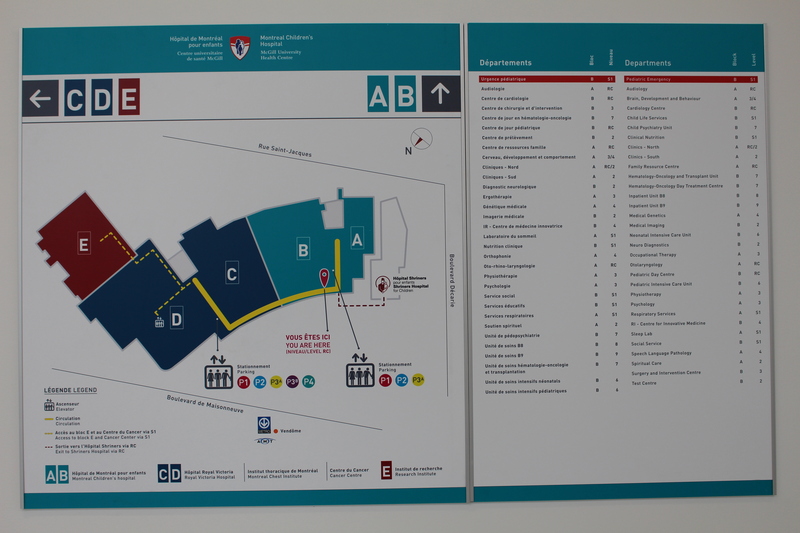 Navigational maps are found at all main entrances, as well as touch screen information posts and information desks. 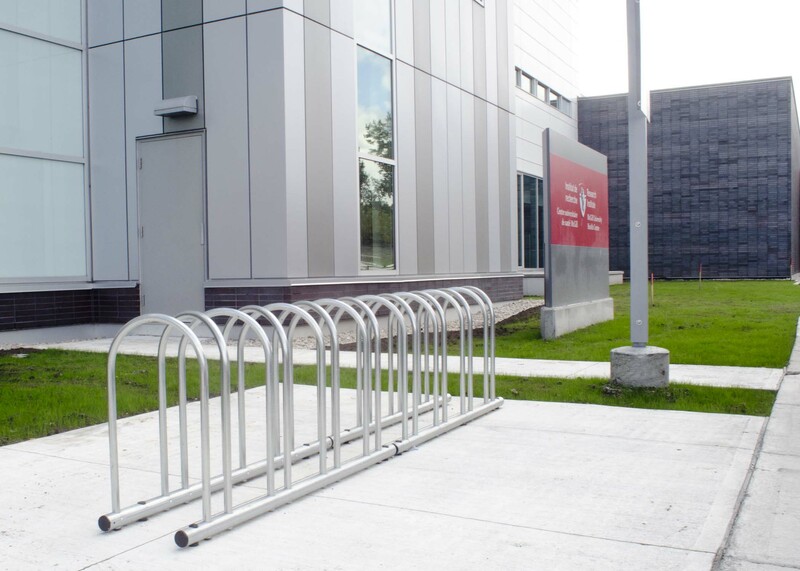 The Glen has 333 bike racks, some located outdoors and some inside our parking structures, for both visitors and personnel to use when cycling to hospital. The entire site is surrounded by a bike path so our cyclists are safe when accessing the hospital. The Glen site visitor parking lot is accessible via Décarie Blvd and located directly underneath the main plaza. Reserved for patients, families and physicians, it contains 1567 spaces (including 28 handicapped spaces) as well as a navigational system that directs visitors to vacant spaces by identifying the specific level, zone and lane. It is directly connected to the hospital via elevators and stairs, so there is no need for visitors to walk outside to access the facilities. Staff will get their scrubs directly from an automated machine located throughout the hospital. After they swipe their ID card, scrubs in the correct size will be dropped into an opening. They can return dirty scrubs to any of the machines in the hospital as well. Behind the walls of the new Glen site runs an extensive network of tubes that will be used to deliver samples, medication, and emergency supplies from places like the hospital pharmacy directly to the central caregiver stations in the patient room pods. With more than 200 patients to transfer in less than a week, the MUHC held a simulated moving day at the Royal Victoria Hospital. This included a make-believe patient played by an intern pretending to make the trek to the new superhospital at the Glen Site. The pharmacy department's new robotic system was designed to reduce dispensing errors to virtually zero. After it receives an order, it picks the medication, labels it and then double checks it for accuracy. It also affixes a bar code to the medication that nurses can scan directly in a patient's room before the medication is given, automatically updating the patient file. Accessible via Decarie Blvd., the main parking lot is located below the main plaza at the Glen site and includes 23 handicapped spaces. To access the underground parking lot, follow the roadway that passes directly in front of the hospital entrances until you reach the STOP sign at the end of this road. Turn left, then immediately turn left again and follow the ramp down to the underground parking lot. Display boards provide up-to-the-minute information on the number of available parking spaces on each parking level (P1-P4). There are two Express Parking lots that are meant for quick visits to the hospital. One is located directly across from the main entrance to the hospital. The second is located past the Cedars Cancer Centre at the entrance to the Research Institute. Payment can be made by credit card at the exit of the lot or at any one of the blue payment kiosks. Passes can be purchased at the Parking Customer Service desks listed below. Weekly Passes can also be purchased at the Glen site from one of the blue parking payment machines. Visitors may also drop off/pick up at the hospital main entrances or at the Emergency Department (for patients coming to the ED). Vehicles must then either park in the parking lot or leave the premises. All entrances, exits and roads must be free of vehicles for safety and security reasons. The City of Montreal is permitted to issue parking tickets for vehicles illegally parked on the Glen site grounds. If you are visiting the Emergency Department (ED), take the dedicated ramp that leads you directly to the front doors of the ED. Turn into the Glen site from Decarie Blvd. and follow the roadway to the front entrances of the hospital. Veer left at the red “URGENCE/EMERGENCY” sign and follow the circular driveway down to the underground parking lot. There are dedicated drop-off spaces for ED drop-off. Once the drop off is done, follow the signs to park in the general underground lot.